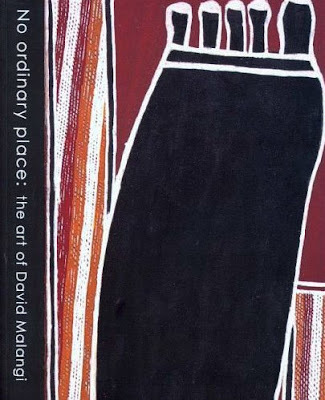 im reading a book about David Malangi, the late Australian Aboriginal painter. 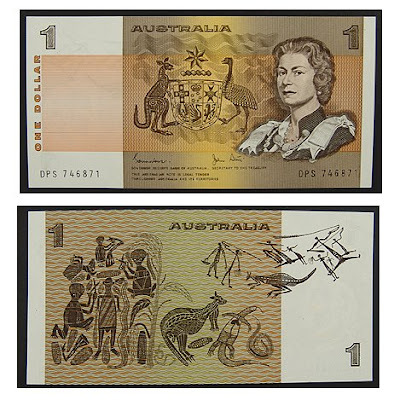 He achieved a degree of fame when the design of one of his paintings was used on the Australian one-dollar note. This was when the currency switched from the pound to the dollar in 1966 (reverse of the note, lower left); the note has been defunct since 1984, when it was replaced by a coin. 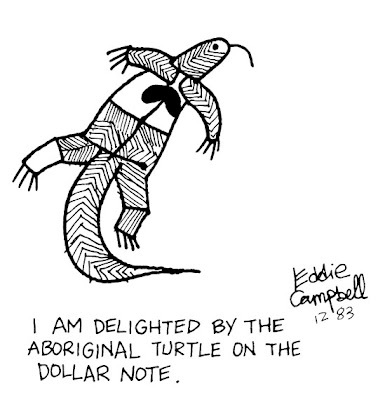 I remember being quite fascinated with the design of the dollar bill when I first visited Australia, and roughly copied the turtle from it into one of my pages in Little Italy. 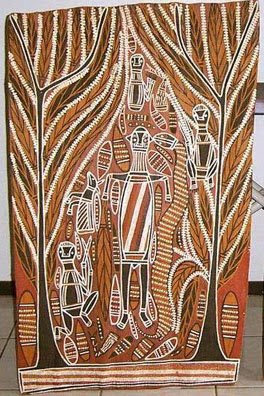 This and the other parts of the design were presumably lifted from cave paintings, since no artist claimed them, though, in my experience, artists are too busy spending money, when they are lucky enough to get hold of the stuff, to notice what's printed on it. Another reason the note fascinated me endlessly was that there was a vertical strip of metal embedded in the paper, in the middle just around the point of the kangaroo's nose (not visible in any scan that I have looked at). But it was never in exactly the same place twice. You could play races with it. The game went like this . You would challenge another person to a kangaroo race, usually with money you had both just received by way of change in a bar or whatever, since it would be unfair to store a sure winner in your wallet. The kangaroo on your note may be anywhere from just about to cross the finish line to having the tip of his nose well over it. For a 'photo finish', a close thing, you would have to hold the notes over each other up against the light. Naturally the winner kept both notes. I do not store such useless information in my noodle, but you could probably get a whole beer for a buck back then. Would this guy be the same artist you've mentioned before? Hi Eddie. Can't wait to sit down with your pants! But just a little note: I think the 'turtle' might actually be a goanna. And what did I know about such things in 1983!! Funny i didn't do a double take now.